Also see from_response method - returns a new FormRequest object with its form field values pre-populated with those found in the HTML form element contained in the given response. Selectors are a higher level interface on top of lxml. It handles broken HTML and confusing encoding. Scrapy best practices on The scrapinghub blog. Conditions separated by / are known as steps. Condition inside  is known as predicate. // allows to get all elements of a particular type, not only those belong to the current node. @ allows to select attributes. Parsing, sanitizing, and more: w3lib - a Python library of web-related functions. Items provide the container of scraped data, while Item Loaders provide the mechanism for populating that container. load_item (and input/output processors) was called twice. Solution: use builders instead. And schema validation. Raise an exception if a field name was mistyped. Any validation, formatting if required. Code to return the object copy. If you need it. Can use ItemLoader or/and validation here. Use if the problem is domain specific and the pipeline can be reused across projects. Don't like s3 storage implementation: blocking botocore + threads. But it may be a good way to do it, efficient enough, reliable and stable. Use if the problem is domain specific and the middleware can be reused across projects. Use to modify or drop items. Use for custom login or special cookies handling. Plain classes that get loaded at crawl startup and can access settings, the crawler, register callbacks to signals, and define their own signals. Shuts down the spider when it exceeds a memory limit. @defer.inlineCallback accepts a function as an argument, that function can yield a deffered or call returnValue, essentially anywhere where you would normally block, you simply yield. The reactor is the event loop mechanism for Twisted. It takes care of executing all of the various timed actions and the execution of the callback/errback stack. Timed actions can be deferreds, etc. Deferreds are simply objects executed by the Reactor. treq - an asynchronous equivalent for requests package. First: if you call basic_publish too often, some messages can be not delivered to the broker. There is no errors or warnings both on basic_publish and connection.close(). Waiting for delivery confirmation solved the problem. Another one: there is no reconnection after connection was lost. And it loses connection after a few minutes of inactivity: pika issue #820. Use locks: threading.RLock() (issues around global state). See Learning Scrapy by Dimitrius Kouzis-Loukas, "Performance" chapter. 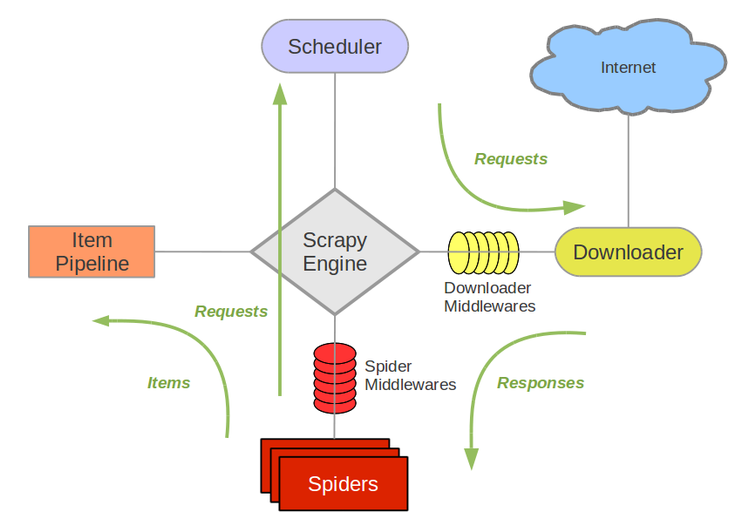 Pipeline: scheduller -> throttler -> downloader -> spider -> item pipelines. Default downloader timeout is 3 minutes. So if some site has a lot of broken links, it may take hours instead of minutes for a spider to finish. Blocking code slows done items processing, and it may become a bottleneck. Example: blocking db connection + slow connection. See How does scrapy react to a blocked Ppipeline? I saw 20rps, but with aiohttp able to reach 100rps. view and fetch functions are very useful. Use LOG_LEVEL setting to specify desired logging level. Default task priority is 0. Autothrottle addon is enabled by default on scrapycloud. It may cause a few times slower scraping rate, sometimes 5 times or more. use AUTOTHROTTLE_ENABLED = false setting to disable it. Each spider execution requires extra ~30 seconds to start on scrapycloud. So 1 spider does 100 requests is much better than 100 spiders each sends only 1 requests. In case if you use blocking db client, you'll, probably, see effect of it. Blocking db clients performs fine if connection is fast: db located on the same server or network. Example, a few db requests on local network vs the Internet: 57ms vs 1.19s. Use cases: add custom binaries, choose another framework for scraping (like use aiohttp). For logging use Scrapy Cloud Write Entrypoint, see the code. Use shub command line tool. Detected error connecting to Docker daemon's host. Use throttling, watch response time. Look at the copyright notice of the site. Use HttpProxyMiddleware (enabled by default) and http_proxy (https_proxy) environment variables. Crawlera is a smart downloader designed specifically for web crawling and scraping. It allows you to crawl quickly and reliably, managing thousands of proxies internally, so you don’t have to. Batch insert usually is more efficient way. Set User-Agent header to something that identifies you. Easy to grow horizontally, just add more spiders, more machines. But, in order to be able to crawl faster, we may need to scale vertically (more CPU, more bandwidth) or build a cluster with each spider effort coordinated (distribute requests to the same domain across many machines). Use lightweight browsers without GUI. The main goal in scraping is to extract structured data from unstructured sources. .jl files have one JSON object per line, so they can be read more efficiently. Headers may contain Last Modified or even ETag, so this must be enough to understand if a file was changed since last time, no need to download the file, only get headers. If you persist raw responses or extracted data on s3, you may not need a database to store meta information, use s3 object meta only. See Automatic Wrapper Adaptation by Tree Edit Distance Matching.